Intercom systems are an integral part of keeping the lines of communication open in a business, creating channels to transmit everything from important safety information to simple updates on changes in scheduling or even allowing one employee to communicate with another. Depending on the size of the business and its specific needs, as well as the type of property needing a system, we at Ivanco, Inc. have the ideal solution to suit our clients in their communication goals and guide them in choosing between a wired intercom system and a wireless intercom system. A wired intercom system, while seemingly less advanced than its wireless counterpart, does present certain considerations – not the least of which is generally cost. While it is the more expensive of the options available, it does provide a more expansive coverage area with fewer issues of interference. This interference is often caused by building construction using metal-framed walls, concrete walls and floors and the presence of the type of extensive electrical wiring often required for the use of office equipment. The most common type of wired intercom system often includes telephone or video intercom systems along with an external paging system. Video systems are specifically beneficial in allowing both audio and visual communication from various access points. Telephone systems enable calls to specific areas of a building, while external paging amplifiers and speakers are useful in paging every area of an entire building. 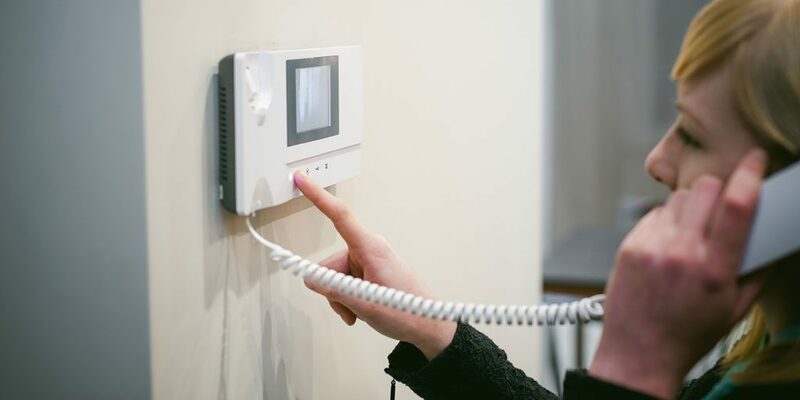 Tying door phones into the telephone systems allows the function of placing calls between visitors and someone in the building through the push of a button. In situations using remotely accessed door locks, the door phones provide one more layer of security between entry-points and those given access. Due to the fact that a wired intercom system is more expensive and has a higher installation cost, it is not always considered the most desirable of the options available. Nor are they always essential, even if a door phone feature is necessary. In these cases, the use of intercoms with a single outdoor monitor and a desktop or wall-mounted indoor station is still an extremely viable solution and requires only a single wire running between the door and the indoor station. A wired intercom system creates a flexible and comprehensive communications platform that is especially useful for businesses and commercial use on properties including school and college campuses, churches, health care facilities and offices with multiple buildings. Each component of the wired intercom system is fully customizable to the size of the space and its specific needs, and a single, centrally located system operates as a main hub for the entire structure. At Ivanco, Inc. we install only the highest quality systems and have full confidence in the superiority of the Telecor AssureCom wired intercom system and its components. In our consultations with our clients, we address their needs and goals in determining which aspects of a wired intercom system best suit them. As a company whose sole focus lies in creating intercom systems of the highest caliber, Telecor has a reputation for reliability and leading edge technology that gives us confidence in installing them for our clients. Our highest goal is keeping our clients and their businesses safe during times of crisis as well as easing their day-to-day communication needs, and the wired intercom systems offered by Telecor enable us to accomplish that. In our many years of installing quality custom commercial security and business security systems for clients throughout the region of Northwest Florida, we have built a solid reputation for using the very best products and providing the highest degree of service in all that we do for clients of all sizes. Call the team of security experts at Ivanco, Inc. today to learn more about how a wired intercom system meets your business needs!